Dr. Jim Haymour is skilled at a number of oral surgery procedures. From extractions to gingival sculpting and biopsies, we provide most oral surgery services right in our Edmonton dental office. Services include tooth extractions, gingival sculpting, periodontal (gum) treatment, Wisdom tooth removal, and other procedures where surgery is needed. We follow a careful process for each surgery, ensuring that patient comfort and care are always our first priority. We perform all types of extractions at Kingsway Dental Centre. Whether you need a simple extraction or wisdom tooth removal, our experts can restore your dental health through skilled surgery and comprehensive patient care. Simple extractions are extractions of teeth that are already erupted (exposed) from your gums. Simple extractions are the easiest of all extractions and heal relatively quickly. If you have a split tooth, severe periodontal disease, excessive decay, or overcrowding, you may need an extraction. We care for your needs right from beginning to end, ensuring a smooth and stress-free experience. Surgical extractions are for teeth that have not yet erupted fully or that are impacted. Surgical extractions are often more complex and time consuming and may require longer healing times. We strive to keep our patients completely comfortable for all oral surgery procedures and your surgical extraction is no different. Surgical extractions may require stitches and diligent aftercare. Our dentists will go over how to take care of yourself after any procedure so you heal as quickly as possible. We use a soft tissue laser to sculpt and shape the line of your gums. If you have a gummy smile or an oddly shaped gingival margin, we can use our relatively painless laser to reshape your gumline in order to improve the appearance of your smile. Gingival sculpting is also useful for situations where your teeth appear too small or because a tooth looks oddly shaped. For severe periodontal disease, our laser can remove bacteria, infection, and diseased tissue. Many patients find it much more comfortable and have a quicker recovery than with traditional surgical methods. Laser use reduces inflammation, eliminates the need for cutting tissue, and reduces root exposure sensitivity. 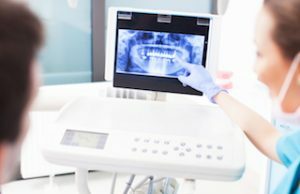 Because your dentist sees the inside of your mouth, even where you cannot see, we are often your eyes for conditions like tumors, oral cancer, and cysts. At each of your preventative exams, Dr. Jim Haymour, Everett Postill, or George Laschuk will perform a visual inspection of your mouth, looking for any abnormalities. If one of our dentists finds something, we can perform surgical biopsies to make sure everything is ok. If we ever see something we feel you should know about, we will discuss it with you and help you take the next necessary steps. Are you looking for a dental office that can take care of all of your needs? Kingsway Dental Centre performs most surgical, endodontic, and general dentistry procedures. Our versatility provides our patients with convenience and continuity of care.